Problem: You’re having rice for dinner, again. We love brown rice because it’s easy and delicious. But if you’re craving just a little pizzazz, here’s a solution: Lightly Fried Millet with Seasonal Garlic Scapes. 1) Vary It When cooking a pot of grains for the week, try a different grain. I’ve been playing with millet–and developing a taste for this fluffy yellow grain. Cook 1 cup of grain in 2 1/4 cups of water. 2) Fry It There’s a reason we all like fried rice. Added fat up the flavor quotient of almost any bland food. But you don’t need to add a vat of fat to get the taste benefits. I used just 1 Tbsp. of a good fat–safflower oil–for four servings. Hint: leftover, cold grains are best for frying, after they’ve dried out a bit. 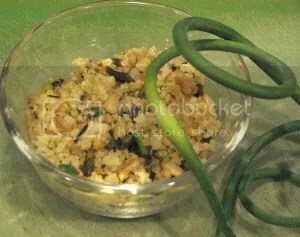 3) Brighten It Garlic scapes and green garlic are in season and add wonderful color and flavor to plain old grains. They’re easy to slice. I tossed about 1 cup of them in oil before frying the grain. Sauteeing just a minute or so takes off the raw edge. 4) Crunch It While sauteing the garlic, I went one step further (totally optional) and added a handful of pine nuts. Slivered almonds or chopped walnuts are a perfectly fine (and a lot less expensive) alternative. Toasting for just a minute or so really brings out the flavor. 5) Finish It After sauteing the garlic and toasting the nuts, I added about 2 cups of cold millet. Crumble before adding as it forms into a solid mass when refrigerated. After adding, leave it alone a couple minutes to brown before turning. It might pop just a little. Cover briefly with a lid if necessary. Once the grain is browned and slightly crispy, turn off the heat and stir in just 1 tsp. toasted sesame oil, if desired. Serve and enjoy.